£728 million was raised by Venture Capital Trusts (VCTs) in the 2017/18 tax year – 34% higher than last year’s comparable total of £542 million. 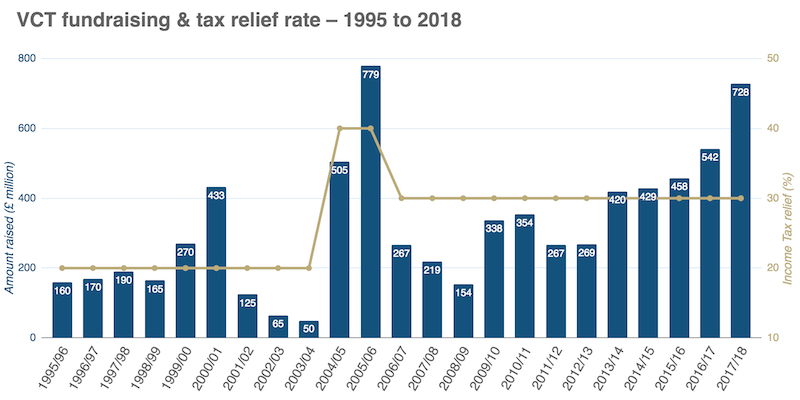 As the chart below illustrates, this is comfortably the highest since VCT income tax relief was set at 30% twelve years ago. The total value of VCT assets climbed 10% over the year, reaching £4.3 billion at 5 April 2018. 2017/18 was notable for how many VCTs opened early in the tax year. By the end of September 2017, ten VCT offers were open compared to only two at the same point the year before. Some of the traditional and bigger names in the VCT industry decided to raise significant funds. The Mobeus and Baronsmead VCTs both launched prospectus offers for the first time in several years. Northern VCTs raised £20 million into each of its three VCTs – a marked step up from the previous year’s small top-up offer that sold out in days. Not every VCT manager ran with the herd, though: both the ProVen VCTs, British Smaller Companies VCT 2 and Hazel Renewable Energy VCTs issued top-up offers limited to £4.5 million per VCT. One reason for the timing, and size, of 2017/18‘s VCT offers was anticipation of the Budget speech on 22 November 2017. The background to this was the Patient Capital Review, with the Treasury rumoured to be considering rule changes and/or potential cuts to tax relief across several venture capital schemes. A clear ‘bump’ can be seen in the fundraising curve as investors and VCT managers alike resolved to get business done before any potential policy changes. Around £400 million worth of VCT shares were allotted before 21 November, with 37 allotments taking place in the final seven days. As it turned out, the Budget did not deliver the feared changes; instead, it was a pleasant surprise for VCT investors. The Chancellor affirmed VCTs’ role in providing patient capital and announced only minor tweaks to the rules. Accordingly, after a typically quiet period over Christmas, investment into VCTs gathered pace as usual towards tax year end. Why does VCT demand keep increasing? Venture Capital Trusts have steadily increased in popularity over recent years. 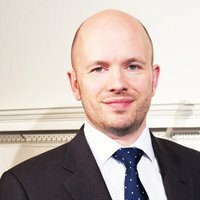 The appeal of tax-free income, the fact they’re the only investment with tax relief on both the way in and the way out, and the strong performance of many VCTs over the last 5 years have all helped broaden VCTs’ appeal – although it should be remembered these are high risk investments and should form only part of an experienced investor's portfolio. Tax rules can change and benefits depend on individual circumstances. Past performance is no promise of future returns and dividends are variable and not guaranteed. Changes to the tax regime on other investments have also helped. Pension changes are beginning to bite, as high earners face the annual allowance taper and a lower lifetime allowance. Income investors are being curbed by the new dividend tax, and potential property investors are being deterred by higher taxes on buy-to-let. VCTs could be an attractive tax-efficient alternative. Although the majority of offers that opened last tax year have now closed, some VCTs remain open. If you are comfortable with the risks of investing in VCTs, there are two good reasons to consider doing so at the start of the tax year. First, you could receive an extra year’s worth of tax free dividends (variable and not guaranteed). Second, the tax relief could potentially be paid to you during the year through your PAYE code, rather than reclaimed in 2019 via your tax return. Where could you invest in the new tax year?